On a cool, slightly overcast Sunday morning, a large group of local trail runners got together – some, like me, knew the trail well, and others were “Chandler Ridge virgins” looking forward to seeing this well-loved trail. Due to the coolness of the morning, the mosquitoes weren’t bothering me at all, but a few of my running partners seemed to be doing a modest amount of swatting. The key lesson here – is always run with a friend who the bugs like more than you! 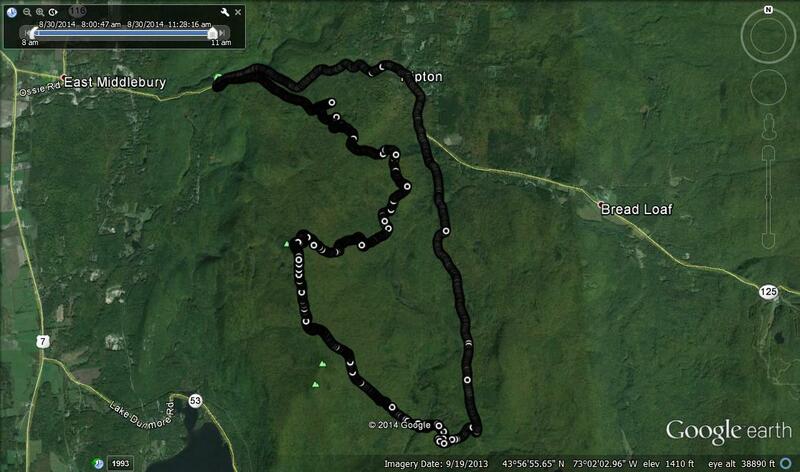 We started the run with the well traveled forest service road climbing steeply up to Silver Lake. It was still pretty early in the morning, so we saw few walkers, although we did see a sign indicating that this part of the trail was being used for the now-legendary “Infinitus” event happening up at Blueberry Hill, and the surrounding trails. 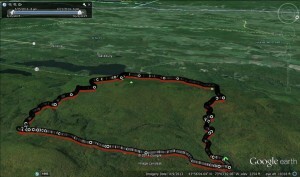 The centerpiece of Infinitus is an 8-day, 888 Km run, that only a handful of runners have actually completed. I was hoping to cross paths with some of these runners, just to see how much of a mess they were at this point, but none happened to be on this section of trail as we were ascending (or later on, descending). Andy, the race director’s quirky sense of humor was on display with his race signs, written both “rightside up” and “upside down” – perhaps for the amusement and/or confusion of the more delirious runners. After crossing the damn, we headed left, on true single track along the east shore of Silver Lake, and after about a half mile, we came to a trail junction, with the right turn switchbacking for a few minutes up to the Chandler Ridge, and the left junction to the trail hugging the shore around the lake. 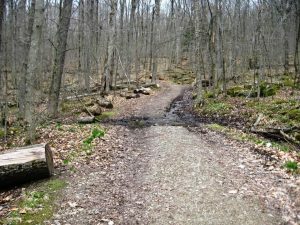 We chose the right trail, and a word for the wise – the left fork in the road, staying close to the lake is very poor for running, although it does make for a pretty and interesting hike. 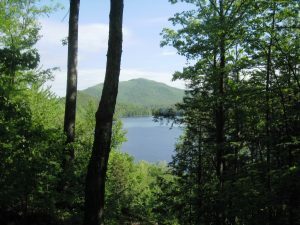 After our crew snaked up the west slopes of the Chandler Ridge, we found ourselves up on top, on a trail which sometimes hugged the west (left to us), Silver Lake side of the narrow ridge, and sometimes hugged the east (right to us) Lake Dunmore side, with frequent views through the trees. The trail up here is in great shape, due to the work done in the aftermath of the 2008 deluge which made a mess out of several of the trails in the area. After about a mile on this ridge, we came to a clearing (which was created during the aforementioned trail maintenance) looking back towards Silver Lake, above its southern terminus, also at the high altitude point of the run. As I stopped for a picture, a few of my more keen-eyed running friends spied a bald eagle in the distance. Squinting as hard as I could, I tried to make it out, but couldn’t seem to focus on it. While bald eagles have made a comeback in Vermont, as in most of the rest of the US, I still have never seen one in Vermont, and I am afraid that my streak continues. 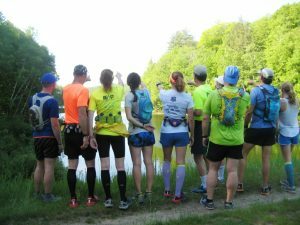 This entry was posted in Midd Blogosphere and tagged Blueberry Hill, Chandler Ridge, Hill Climb, Lake Dunmore, Leicester Hollow, Moosalamoo, Running, Silver Lake on June 6, 2018 by Jeff. At the far side of the parking lot, the obvious trail down begins, and after about a quarter mile, the right turn at the trail junction begins the descent to Silver Lake, in earnest. 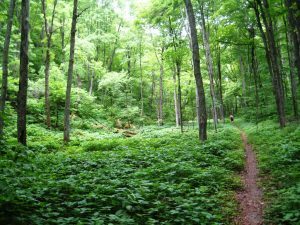 Running down this one section of true single track trail, I heard some scampering sounds in the woods, and reminded myself of the usual adage – “If you can hear it, it is just a squirrel”. However, at one point, I turned around and saw my first bear of the season bolting up the hill, a few yards behind me, and getting away from me as quickly as it could. My guess was that it was running away from whatever I was running away from. That said, it is always a rush to see these magnificent animals, and I stopped to watch it amble away, made all the easier by the lack of foliage at this altitude, this easy in the season. Someday I will get a decent picture of one of my bear incidents! 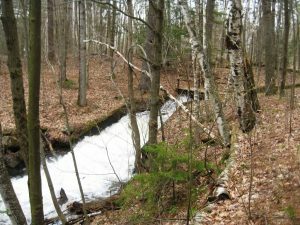 This entry was posted in Midd Blogosphere and tagged Branbury State Park, Hill Climb, Lake Dunmore, Moosalamoo, Running, Silver Lake on May 8, 2018 by Jeff. 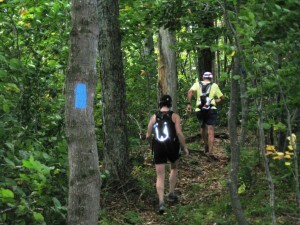 This entry was posted in Midd Blogosphere and tagged Hill Climb, Moosalamoo, Oak Ridge Trail, Ripton, Running on August 30, 2014 by Jeff. 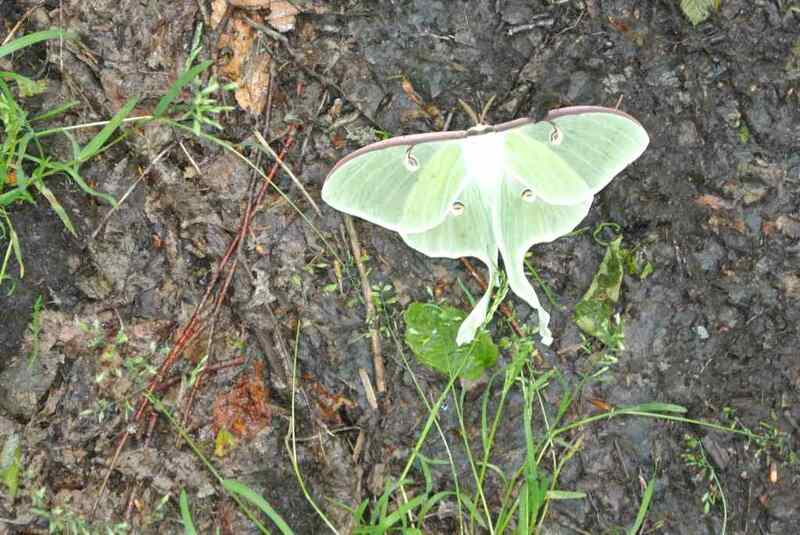 On Saturday, the longest day of the year, I set out to explore a “loose end” which I discovered about a year ago. Last spring, right around Easter Sunday , I set out to explore Forest Service Rt. 92, and after a lengthy climb, found myself in too much snow to continue further, and vowed (to myself) to return. 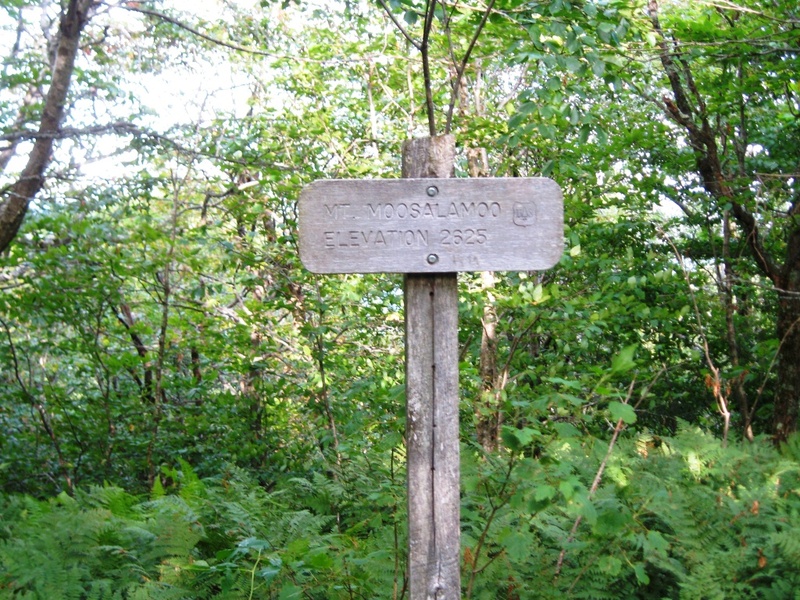 During this previous run, I achieved the ridge line of the north shoulder of Mt Moosalamoo, and noted that the trail followed the ridge line to the south, towards the Moosalamoo summit. At the time, I had concluded (incorrectly as we will see!) 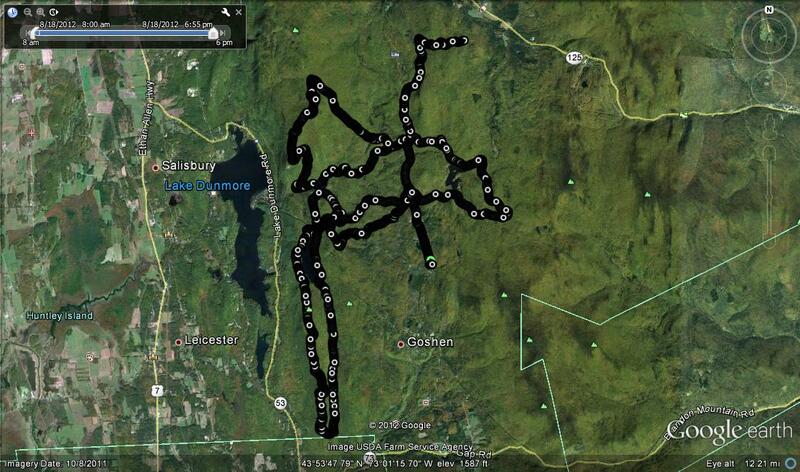 that this trail found its way to the actual summit, and I planned this new run around this assumption. So, I set out for what I assumed would be an hour to hour and a half-long run, and made the mistake of not bringing any water, despite the fact that I was heading into an area where the key connection was not on any map, and, in retrospect, suspect. You can’t die of thirst in the mountains of Vermont, right? 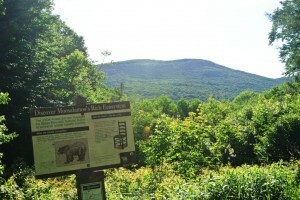 So, I drove to the trailhead for Forest Servine Road 92, found on the Ripton-Goshen Road about a mile in from Rt 125 just past Ripton on the way to the top of Middlebury Gap. Look for a National Forest Service sign on your right, and if you pass Camp Silver Towers, you have gone too far. I found a good place to park about a third of a mile up this narrow but passable dirt road. At the start of the run, I followed my previous run, relentlessly, but runably uphill. 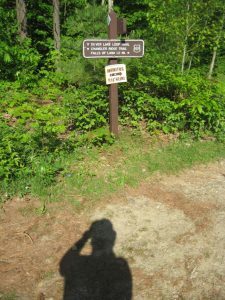 A few options occur for runners, and at the first trail split, I headed left, opting for what is labeled as 92 over 92A by the signs (although not by the Moosalamoo region map, which labels them oppositely! ), and at the next trail split, I bore right, on the more uphill course, rather than taking the left on the more traveled pathway leading to the Wilkinson Trail network, which will be the object of a future posting. Once again, I reached the first height of land, after about 2 miles and 700 ft of climbing, and this time, bore left (south) on this continuing double track abandoned road. 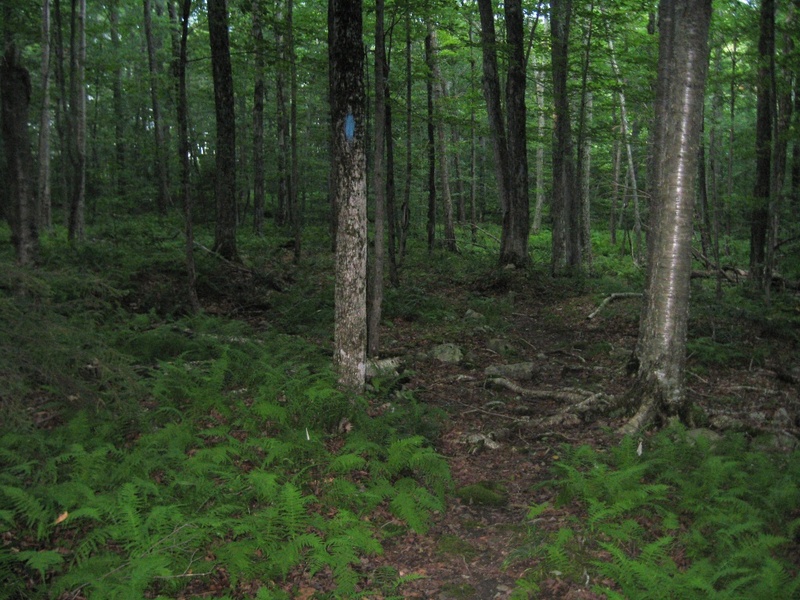 The climb to this point was pretty straightforward, other than the nasty stinging nettles which popped up from time to time, and seem all too common on the trails in the Moosalamoo Wilderness. About half way up, I also crossed the Oak Ridge Trail, which I suspected would be part of my planned descent, once I made my connection to it near the summit. Upon seeing this sign, I realized that all of my assumptions as to where the heck I was, were wrong! 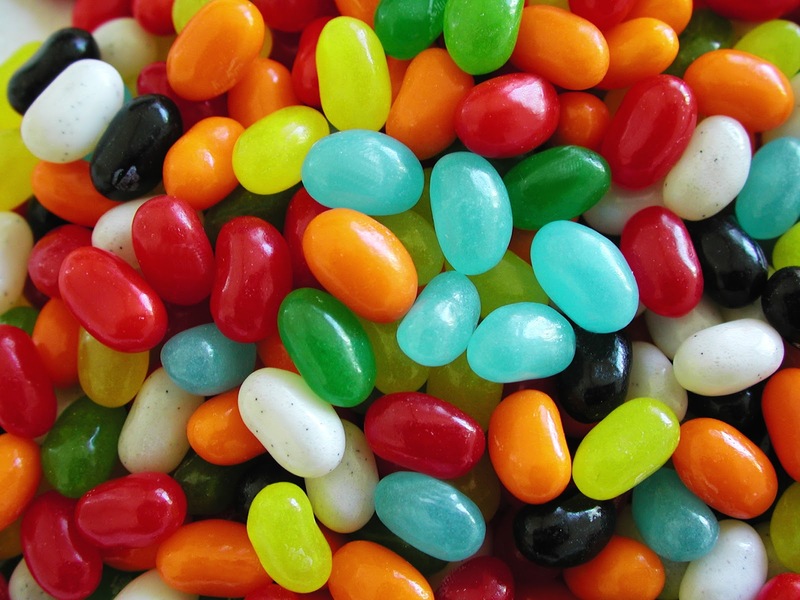 DAGNABBIT! 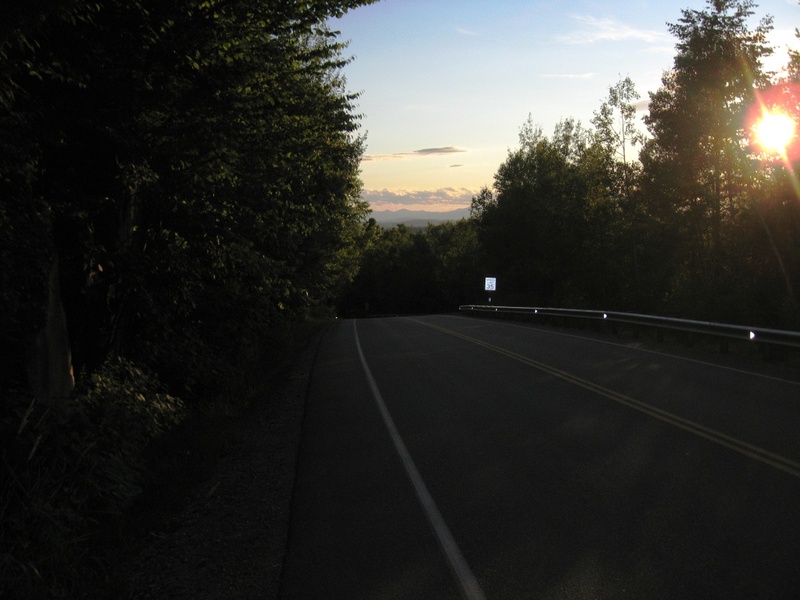 The fact that I was in the Keewaydin network meant that I had found myself on the opposite side of the mountain from my car, on the west side over looking Lake Dunmore! 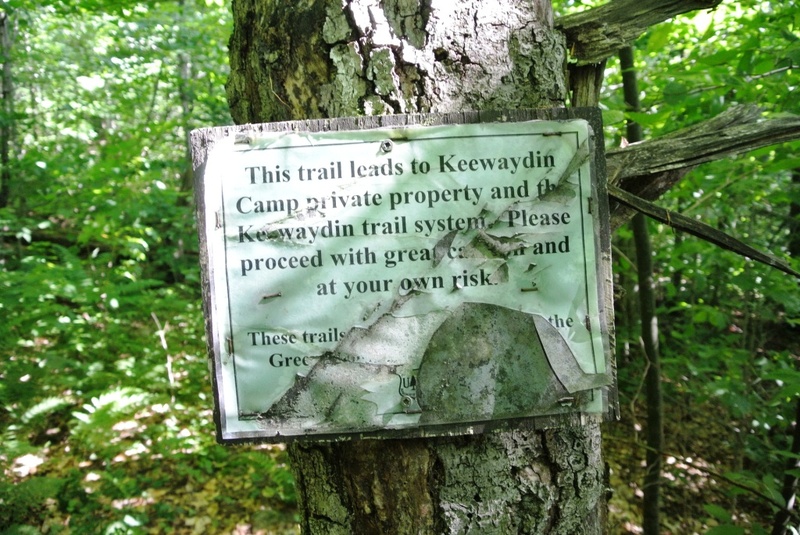 To complicate matters, I was not particularly knowledgeable of the Camp Keewaydin trail network, as it is separate from the Forest Service trails, privately maintained, and not shown on any publicly available trail maps. 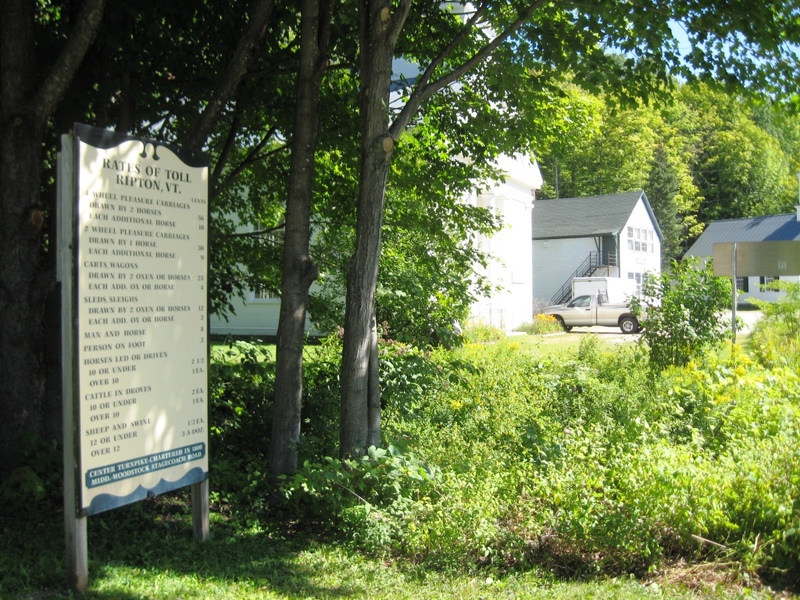 Now, I knew I had two options – I could look for descending trails, find my way to the shores of Lake Dunmore, admit defeat, and find a telephone to call for a ride home (cell phones don’t work there, and I hadn’t brought mine anyways! 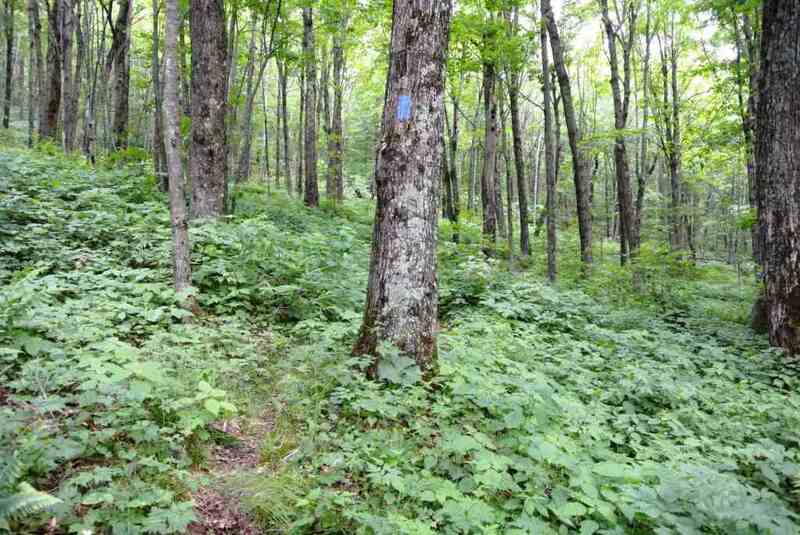 ), or find trail connections which would bring me to the summit, at which point I knew of several longer descents which would bring me home. 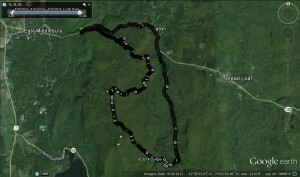 At first, I considered the short easy option- the descent into Camp Keewaydin on the shores of Lake Dunmore. But, did I really want to emerge from the woods, covered in mud, and stumble into a kids’ campfire looking like Yeti? Worse still, what if I stumbled into the archery range to meet up with the 10 year old sons of the most powerful and wealthy men and women in the country, when they were armed with bows, and aching to prove their manhood? Nope – back up the mountain it was! Of course, the question was how, other than just “go up”? 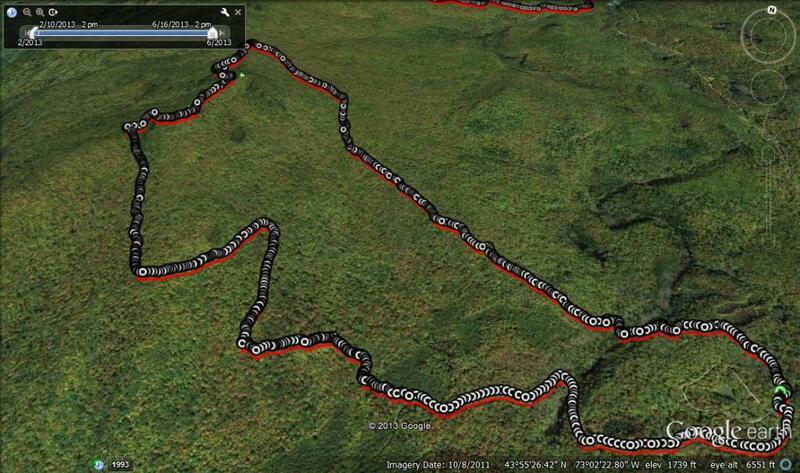 The trail names I came across, as part of the private system were unfamiliar to me – the Cub Trail? the Cliff Trail? 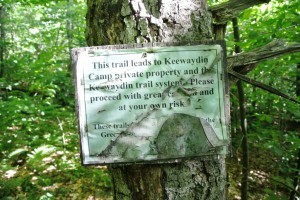 Finally, I came to a trail name which I recognized – “The Keewaydin Trail”. 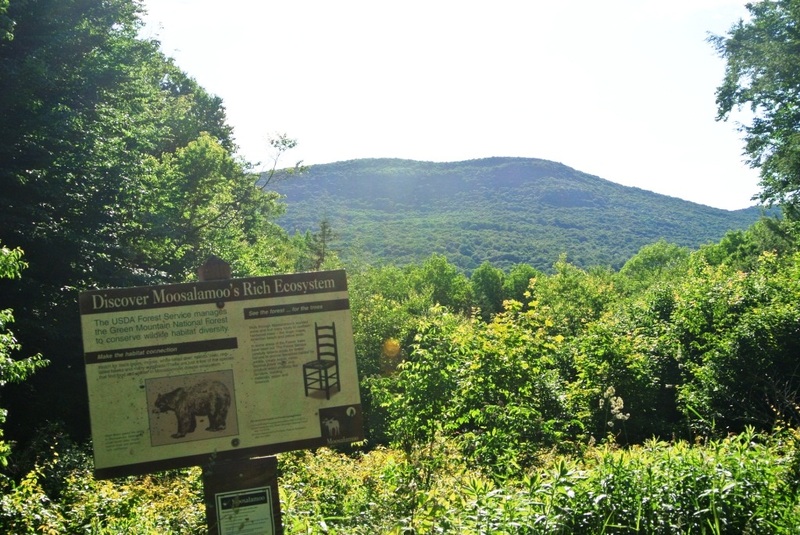 I knew this trail would bring me close to the summit of Moosalamoo, and offered a descent back to the east side of the mountain, admittedly at some distance from my car. 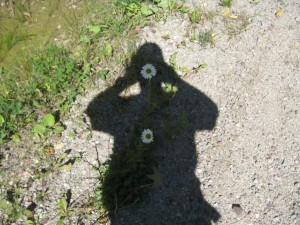 So – back up the mountain I went! 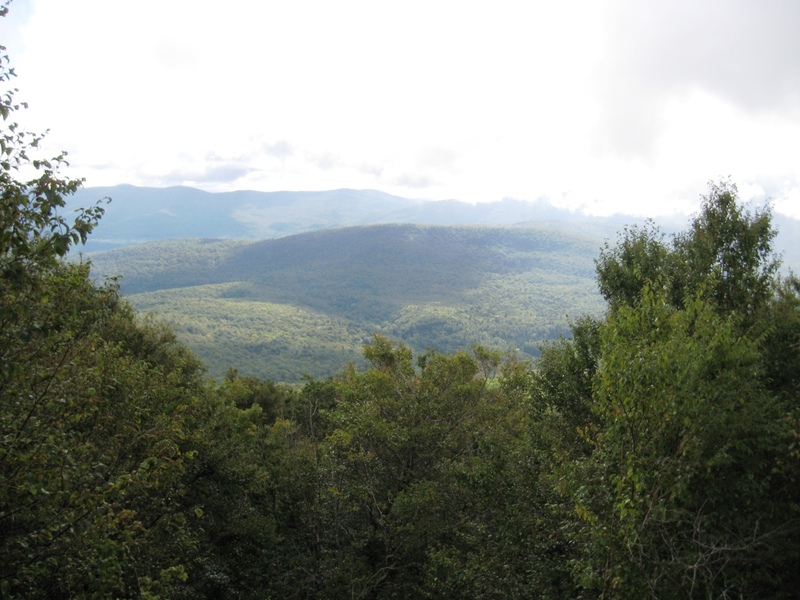 I eventually found myself at the trail’s end, about a half mile from the summit, and chose to find my way to the top, since I figured by this time that I had earned it. 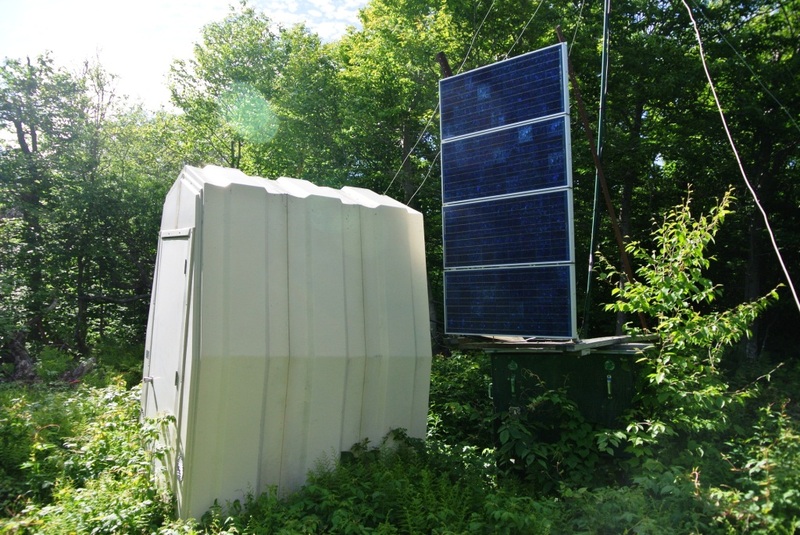 The only structure at the summit was one that had never caught my attention in the past – there is white “pod” which looks about the size of a comfortable porta-potty here, and in the past, I had assumed that this is exactly what it was. 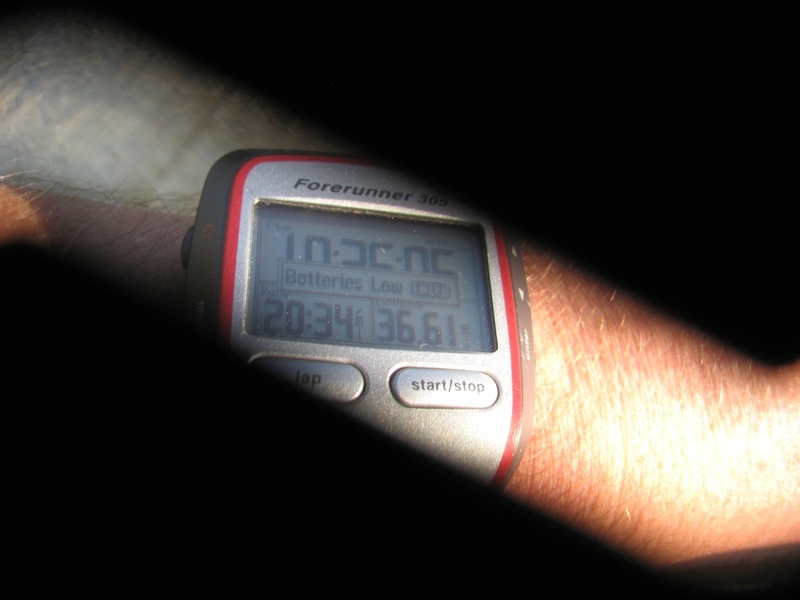 However, on this run, I decided to check it out, since it was connected to solar power panel. Wow – some kind of deluxe backcountry outhouse? Checking it out further, I noted that it had a locked door, which pretty much meant that it was either the most prestigious summit portapotty in the country, or perhaps it served some other purpose – anybody know purpose this structure serves? 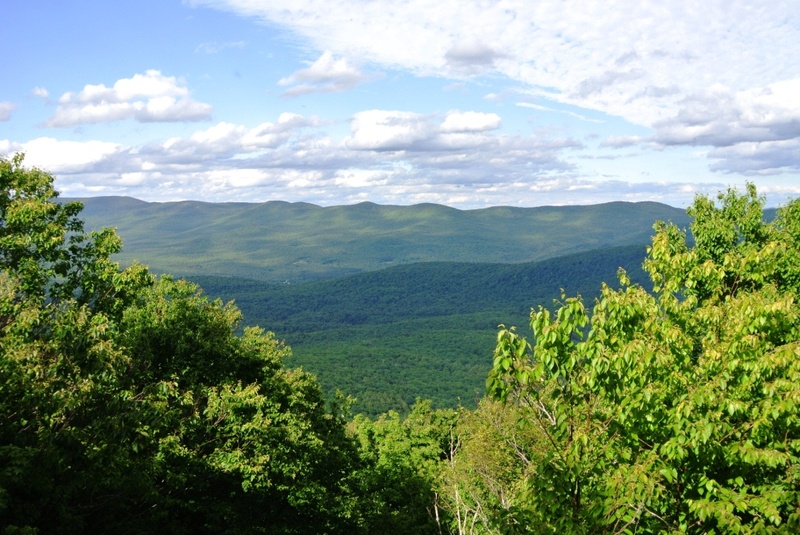 I was, however, rewarded for my efforts with a stunning late afternoon view of the main ridge of the Green Mountains to the east. I would bet that the long flat summit to the left of this shot is of Breadloaf Mountain. Retracing my steps back to the continuance of the Keewaydin Trail, which I knew would get me home, a minute or two off the summit I came across a young, fit, spirited, but obviously confused family who asked “Are we almost to Silver Lake”? 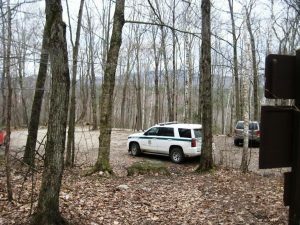 I pointed out to them, that they had climbed far beyond the Silver Lake trailhead, and were in the process of turning a 2.5 mile hike into an 8 miler, if they were coming up from Branbury State park, which of course, they were. I made sure that they knew their way back down, let them know that they could find their way home by retracing their hike, and assumed that they would be fine, although very tired upon their return. The descent on the Keewaydin trail was very slow, as I knew it would be based on my past experiences. This is not my favorite running trail, but it is usually easy to follow, and I knew it would get me home. 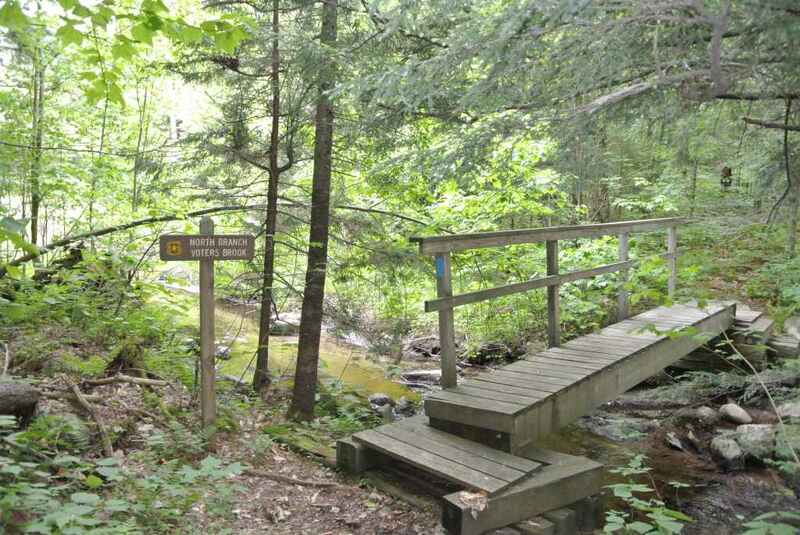 This trail ended when it met the gravel road leading to the Voter Brook Overlook, and when I reached this, I took a left turn for the short descent, and longer climb up to the Ripton-Goshen Trail. By this point, I was getting very thirsty, having neglected to bring any water under the assumption that I was doing a much shorter run, and by this point, I had been out for the better part of two hours – fortunately it was a cool, comfortably evening! I took a left on the main road, and had a pretty easy final few miles of higher tempo running on the dirt road, only interrupted by a great view back towards the Moosalamoo summit. While I was wary of bears on this run, given the increasing frequency of bear encounters in this area, I could see that some hunters had been clearly frustrated by their inability to find any of these critters – the bear depicted on the sign at this clearing had clearly born the brunt of the shotgun blasts of a few rather frustrated woodsmen! Returning to my car, this ended up being a 10.5 mile run. Normally, this would not be a big deal, if it was not for the fact that this run included over 2200 vertical feet of climb and descent, much of it on rough, slow trails, so this entire run required almost 2 and a half hours! 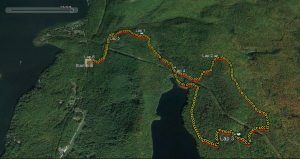 Also, this would be a difficult run to describe in full detail for duplicating until I become more familiar with the trail network on the west side of Moosalamoo. 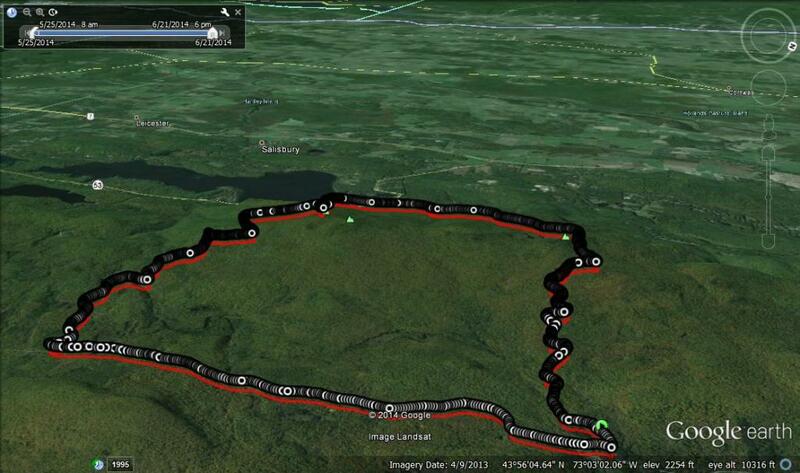 I have got to lay my hands on a map depicting the Camp Keewaydin trails! A note of explanation on the Google Earth projection of this run – I have turned it 90 degrees, so that top of the page is west, rather than north, to better depict the run. 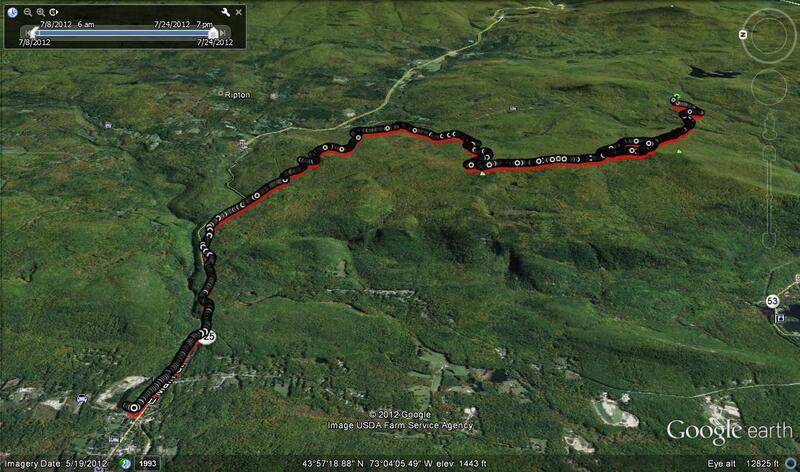 I began the run in the lower right hand corner, and ran this loop in a counterclockwise fashion. 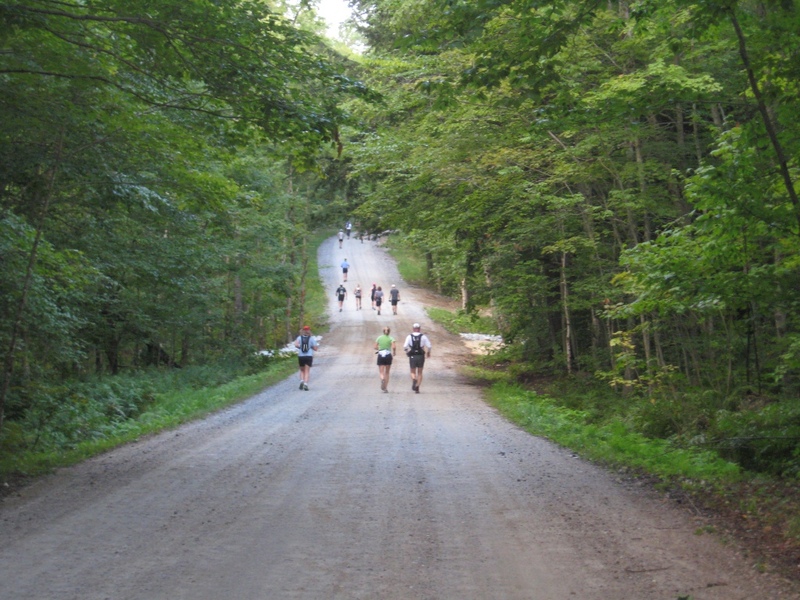 This entry was posted in Midd Blogosphere and tagged Camp Keewaydin, FS 92, Hill Climb, Keewaydin Trail, Moosalamoo, Oak Ridge Trail, Running on June 22, 2014 by Jeff. 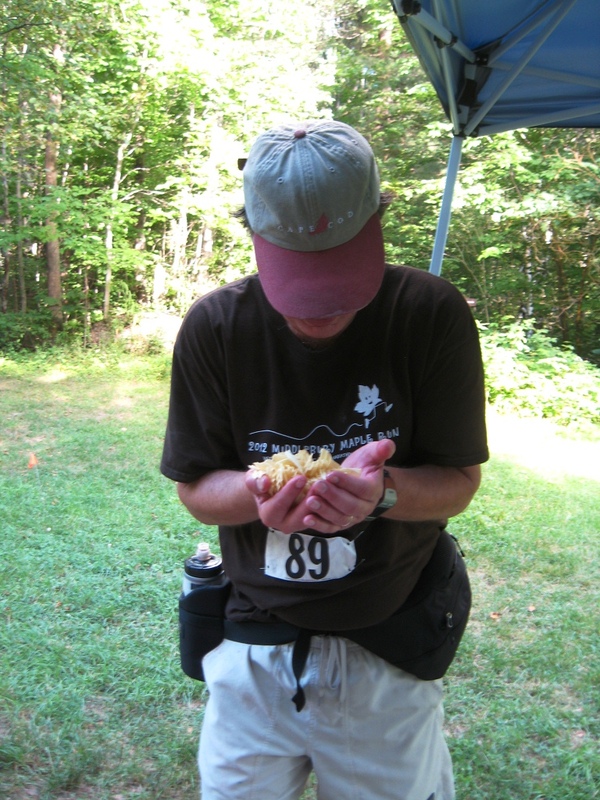 This entry was posted in Midd Blogosphere and tagged Blueberry Hill, Chandler Ridge, Hill Climb, iPod, Moosalamoo, Running, Silver Lake, ultramarathon on August 19, 2012 by Jeff.